Published: June 28, 2015 • Modified: November 7, 2018 • by Author: Analida • Word count:702 words. • About 4 minutes to read this article. 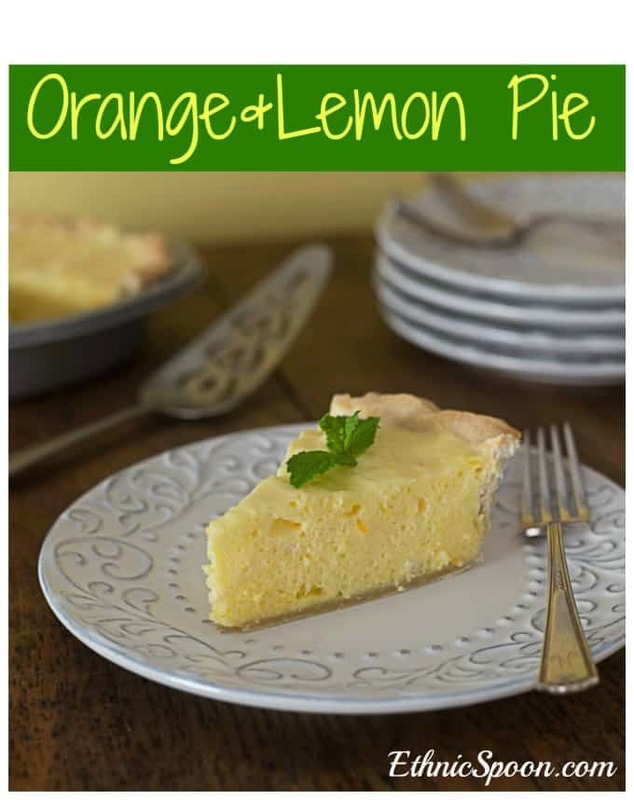 Here is a tasty and light orange and lemon pie recipe your family will love. This whips up so light and fluffy and is the perfect ending to a family meal. This has a really light meringue with a nice citrus flavor. 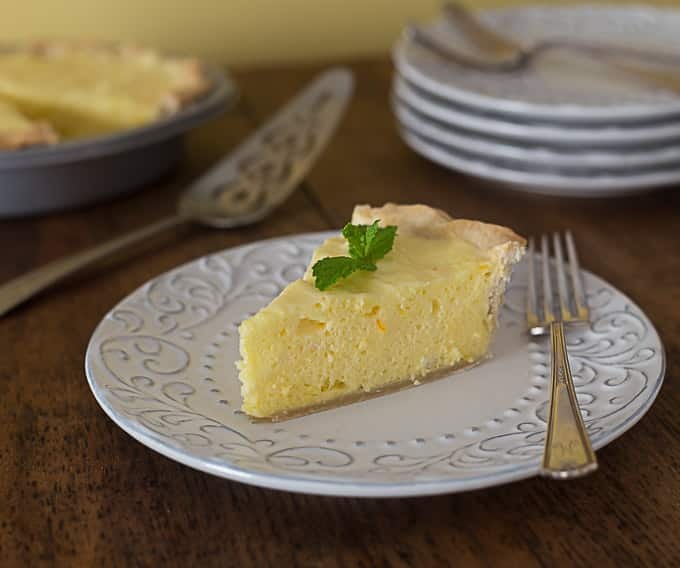 Fourth of July is around the corner and if you need to take a dessert to your family picnic, here’s a great idea for you: Orange and Lemon Pie. Nothing says summer better than citrus. This orange and lemon pie reminds me “a little” of key lime pie, minus the gazillion calories. This is a healthier version, let’s say. It’s refreshing, easy to make, and fairly inexpensive. It is also light, fluffy and delicious. All in all, a perfect summer dessert! For this recipe, you can make your own pie crust or you can use a ready made crust. It’s up to you! 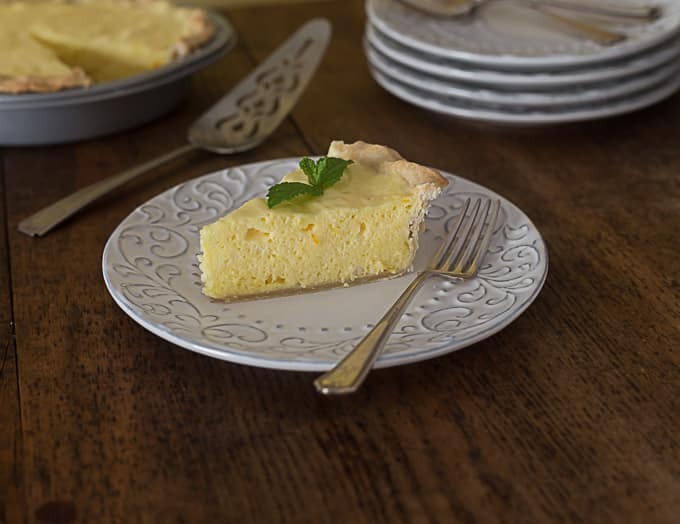 Orange and lemon pie is made with both the juice and the rind of lemons and oranges. The rinds add a lot of visual interest to this dessert. The result is a sweet and tart combination of flavors, all baked inside a delicious, melt in your mouth flaky pastry. Now, top all this with a dollop of fresh whipped cream, if you wish. Yum!! One word of warning: Make sure you leave enough time for the pie to set. My recommendation? Make your orange and lemon pie the night before to allow ample time. I think citrus desserts are great anytime of year, especially in summer. Thankfully we’re able to enjoy these fruits all year long. Oranges and lemons have been around for thousands of years. As a matter of fact in ancient times, oranges were given as tribute to the Chinese emperor. Oranges were also prized for their medicinal qualities and their essential oils. Mind you at this time the type of oranges we know today were not around; they tended to be bitter and smaller. Oranges were first planted in the US in the late 18th century. If you are interested in more dessert recipes here are a couple more to check out below. You can bookmark them and try them later or pin them on Pinterest. Enjoy! Here is a tasty and light pie recipe your family will love. This whips up so light and fluffy and is the perfect ending to a family meal. This has a really light meringue with a nice citrus flavor. Place pie crust into an 9" pie pan. Crimp the edges to create a decorative effect. Freeze for about 20 minutes. Blind bake the shell for about 15-20 minutes, or until the outer edges begin to turn color. Remove from the oven and allow to cool for about 30 minutes. In a sauce pan combine the gelatin, 1/2 cup of sugar, and a pinch of salt. In small bowl whisk together the yolks, lemon juice, orange juice and water. Stir the juice into the gelatin mixture. Cook over medium heat whisking constantly until mixture starts to boil at the edges. Transfer to a bowl and stir in the rinds. Chill in the refrigerator for about 30-40 minutes or until it is the consistency of raw eggs. Using a stand mixer beat the whites with a pinch of salt. Start adding the remaining 1/4 cup of sugar. Continue to beat until the whites form soft peaks. 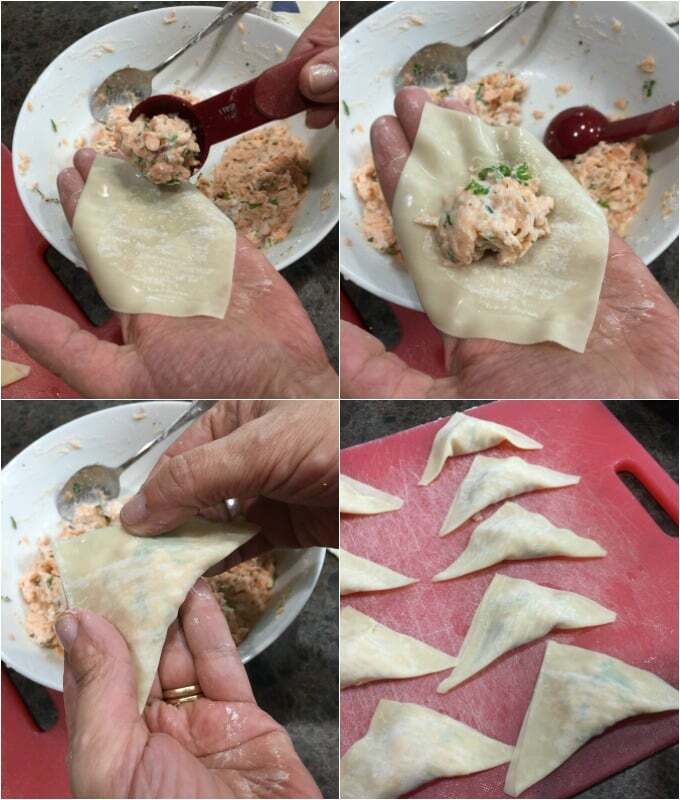 Fold the egg yolk mixture into the beaten whites and combine thoroughly. Pour into the cooled baked pie shell. Refrigerate for about 4-8 hours before serving. Citrus desserts are my FAVOURITE! Orange and lemon make the perfect combo. Thanks for linking up to the Bloggers Brags Pinterest Party. I have pinned your post to the Bloggers Brags Pinterest Board. Thanks again! Citrus are my favorite too!! Yum! 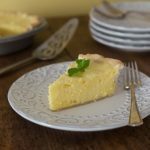 This pie sounds so light and fresh, perfect for summer! It is light and refreshing!!! This looks yummy. I used to just be a chocolate kind of girl but my hubby loves lemon and I’m starting to really like it too. I’ll have to make this sometime soon. 🙂 Make it! It’s so light and refreshing. 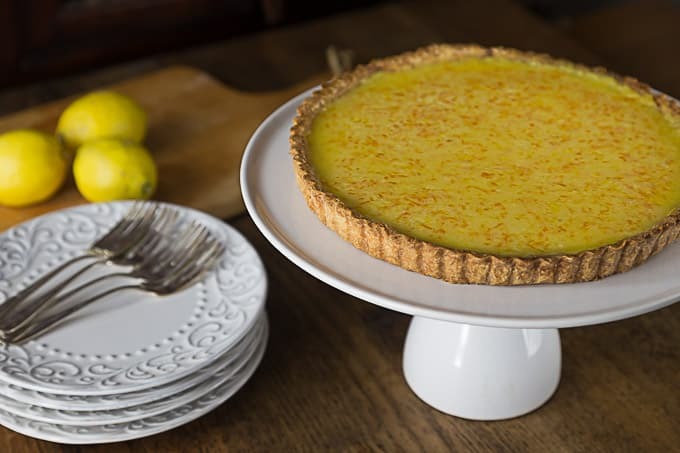 I love lemony desserts – this looks divine and not to difficult. Perfect for the holidays! Hi Lisa! Thanks, yes it is perfect for the holidays. It’s light, and delicious. I love citrus desserts after a heavy, holiday meal. This is just such a dessert! It sure is! thanks for your comment. This pie looks so delicious, I can’t wait to try this recipe! Happy Valentine Day and thanks so much for sharing your awesome talent with us at Full Plate Thursday! Hi Miz Helen, happy belated Valentines Day. This is one of my favorite desserts in the summer. It is so nice and light. Have a wonderful day! The egg whites seem like they are raw??? Could this be? Meringue on the inside. Husbands idea to make. Fun time for him to see how to do. Will taste tomorrow. Hi Cathy, hope you enjoy it! Hi Analida, Yes we started on it Sunday at Church’s dinner on the grounds. A Big hit and it was very good. Meringue flavor was on the inside. We will make this again. Thanks for sharing! Hi Cathy! I am so glad you liked it. It’s one of my favorites because it tastes so light. You are so welcome.